That sharp and shooting pain accompanied by the consequent dull ache we feel after a long day- all too familiar. Lately, I’ve been suffering from sciatic pain, left confused as to what triggered it. I knew I hadn’t fallen or lifted anything too heavy, so I was truly clueless. After countless prescriptions of pain medication, multiple homeopathic remedies for inflammation, and losing 40 pounds, I’ve begun to grow weary and discouraged. It finally came to me, with the help of my physical therapist, that I needed to focus more on posture. Posture. Brilliant! Posture isn’t something that is talked about nearly enough. Statistics say that approximately 80% of the population will experience back pain in their lifetime. With how common it is, I’m surprised more discussions aren’t raised about it. Almost everyone I have asked has suffered from sciatica specifically or some level of lower back pain. We’re in the age of technology, meaning we’re sitting in front of screens a lot more than previous generations. Sitting has been compared to smoking for how bad it can be for our bodies! Do we pay attention to how we’re sitting or even how long we are seated for? Essentially, I aimed to focus more on my posture throughout my day. I realized my back muscles were SO weak and I slouch 90% of the day. When thinking about how I sit, it’s only natural to look down to those things that weigh me down in the front too (boobies). 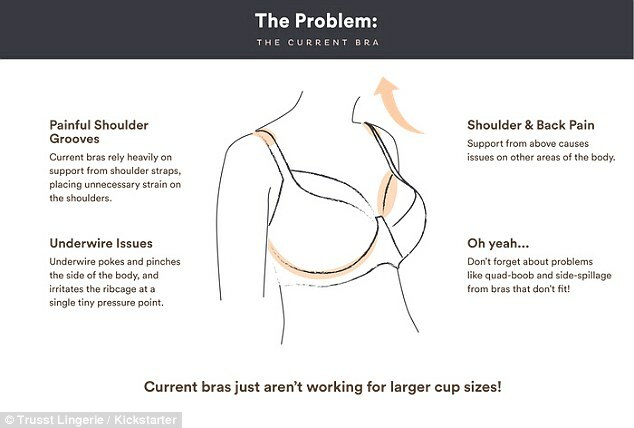 When it comes to bras, I’m usually discouraged and just frustrated! They usually dig into my skin, move around to locations they shouldn’t be, and leave me feeling overall irritated and unsupported. With the help of my wonderful physical therapist, I curated a list of simple, at-home exercises that stretched out my muscles AND strengthened them. She made it clear that the alleviation needed to come from strengthening my core and back. This article gives some of the best exercises (low impact) to help us build up these muscles. If you’re tired of self medicating and the endless stream of Advil or Tylenol to no avail, try this more long lasting solution. Your body will thank you later, I swear! It was well beyond time- I needed a new bra so desperately. I needed one that supported my back to help correct my posture. Keeping my spine in alignment as much as possible and strengthening my back muscles seemed to be the only resolution. I have always been a fan of sports bras, because I have played sports for as long as I can remember (3 years old). With these new exercises I picked up, I knew that a sports bra was going to be my best option. I was excited to dive into new research when this new year started so I could buy something that could help me relieve this pain. While thinking about buying a new bra, I had to think about why I had such a hatred for regular bras and needed to find the opposite of that. I hate the lines bras leave, I hate the uncomfortable underwire, and that they stretch or get worn out fairly easily. Bloom Bras understands that struggle and focuses on making these problems go away, which is remarkable. When doing my research, I stumbled across research that peaked my interest. I’m always looking for ways to improve upon my professionalism to maximize my success- which most of us are- especially in this new year. I came across this compelling article written in 2015, published by Fast Company, about the correlation between good posture and its impact on success. Often we hear how the mind is more powerful than the body- which may be true. We usually don’t discuss the flip of that- how the body can heavily influence the mind. In discussion with colleagues, I’ve heard of a phenomenon called “power poses” which caught my interest. These poses are designed to have the physical body take up space, upright, in attempt to trigger a feeling of power and confidence. Not only will better posture increase your confidence, it may prevent future back pain. This allows us to work with a clearer mind not focused on pain, in turn, making us more productive. Being a student, I need all the productivity and focus I can get. Focusing on material or work matters, when feeling a constant pain, has proven difficult. My posture was something I have improved little by little, by just making it a habit. We can all do it together! It’s just a matter of forming healthier habits, as I mentioned in my previous blog, one of my 2019 goals. I just added “adjusting posture” to the list! Who thought posture could be so life changing? Adjusting my posture has been the smallest, but most significant part of my life in 2019. I hope further research on how to adjust your posture will yield the same results for you all suffering with me. I feel your pain. Start here at this article published by the American Chiropractic Association for reference and more credible information about posture. If you find further research that’s relevant, please reach out! We want to hear you.